Unfortunately, with tenting and fumigation, you and your family will have to vacate your home for three days. Moreover, you’ll have to clear out your home of animals, plants, and items that are liable to be effected by a fumigation. On the other hand, microwave extermination isn’t so invasive. 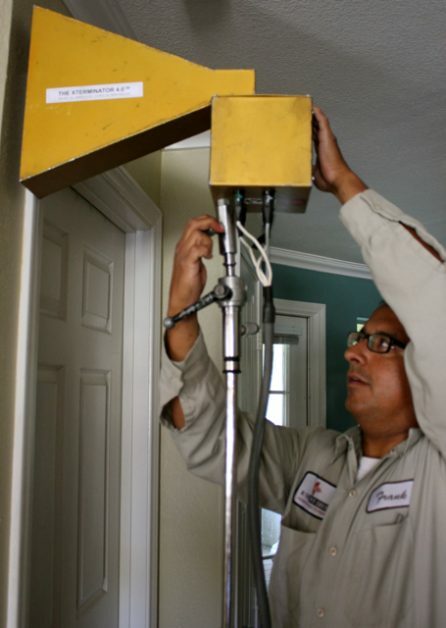 Carry about your day to day as our exterminating tech targets termites within your home. Again, fumigation harms humans, pets, plants, and food. Any food or plants that are left in the house will be damaged, and most likely need to be thrown away. With microwave technology, you can leave your food and plants where they are (so long as they aren’t directly in the way!). Fumigation is rather harmful for the environment, since the intent of fumigation is to sterilize your environment of pesky termites. Microwave termite extermination is far more ‘green’ since it doesn’t release poison into the atmosphere. Microwave tech simply pulls a bit of electricity to perform an extermination. If you’ve encountered a termite infestation, consider opting for our hi-tech microwave extermination technology. It’ll allow you to maintain your day-to-day, keep food and plants safe, and it’s the greener option. Get in touch with a termite exterminator here at Hi-Tech Termite today!